San Diego County has long been blessed with a surplus of world-class bassists. Having Bob Magnusson (Buddy Rich, Sarah Vaughan), Gunnar Biggs (Buddy Rich, Barney Kessell) and the late Chubby Jackson (Woody Herman, Lionel Hampton) living in and playing around the San Diego and Southwest Riverside Counties has meant not only that touring world-class jazz musicians can find top-rank sidemen when in town, but that we locals are spoiled. Rob Thorsen is part of that stable of local bass players who are the equal of anyone living and working in New York, New Orleans or Los Angeles. His new album finds him surrounded by equal talent in locals like trumpeter Gilbert Castellanos, pianist Geoffrey Keezer and drummer Duncan Moore running through a set of jazz standards and Thorsen originals in fine straight-ahead fashion. Songs like John Coltrane's "Giant Steps," George Gershwin's "The Man I Love" and Cole Porter's "It's All Right With Me" get stellar treatment  clean arrangements give the players plenty of room to show off their virtuosity. Castellanos turns in a particularly noteworthy solo on "The Man I Love," and it's a real treat to hear Thorsen take the lead during the opening to "It's All Right." Thorsen's originals are nice slices of modern jazz  nothing as memorable as Gershwin, Coltrane or Porter contributed, but very pleasant jazz compositions given royal treatment by some of the area's best musicians. 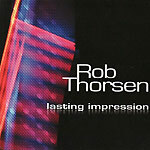 Besides, each track offers the opportunity to hear Thorsen either setting a rock-solid foundation with Moore or taking solos of his own  giving the sort of pleasure one gets from hearing someone who is among the very best at what they do.